Energy efficiency is the number one topic at the ENGEL AUSTRIA booth during the Deutsche Kautschuktagung, DKT, (German Rubber Conference) from 2nd to 5th July in Nuremberg, Germany. 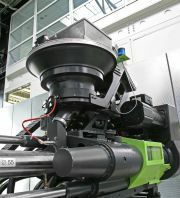 With three machines on show, the system supplier for injection moulding technology demonstrates best-in-class approaches to manufacturing premium quality rubber and silicone parts in a sustainable and at the same time economic way using bespoke systems.
. The key is the servohydraulic ENGEL ecodrive which substantially reduces loss energy. Because the drive is only active during machine movements, no energy is consumed while the machine is stationary, for example during the heating phase. When at a standstill, ecodrive eliminates idling and purging energy consumption as occurs in conventional hydraulic systems. ENGEL hydraulic injection moulding machines with ecodrive thus achieve energy consumption figures that can compete with those of all-electric machines. Moreover, the amount of energy needed for oil cooling is lowered. Because the hydraulics are still in place, conditions are perfect for hydraulic corepulls, cold runner nozzles and high-speed mounting systems. The ENGEL elast 2700/400 V compact machine will be producing lashing straps with an 16-cavity mould by ÖKT, Hostim/Czech Republic during the trade fair. One boost for ergonomics is the low operating height of the machines in this series, which facilitates manual insert-placing work. The raw materials supplier for this exhibit is Kraiburg, Waldkraiburg/Germany. ENGEL will be dedicating two exhibits to silicone processing at DKT. One of them sees ENGEL producing valve bodies from liquid silicone on an ENGEL victory 200/50 LIM and for the other, an ENGEL victory 300/120 HTV will be demonstrating approaches to economic solid silicone processing. The centrepiece in this application – 8x front wall seals – is the ENGEL roto feeder feed system, which ensures maximum process reliability in the processing of thermosets and solid silicons. A rotating hopper with counter-rotating screw ensures that the material is fed in continuously, without inclusions and at a constant pressure. Injection moulding of silicone rubbers is also the topic of the ENGEL keynote on meeting Wednesday (4th July) at 5 pm in the Amsterdam room. Leopold Praher will be presenting the latest developments and future potential of silicone processing.